2014 was an interesting year... firstly, I thought I had not signed up for Blenheim, but the pass arrived anyway so I must have, and I managed to get a place in London Hyde Park. The trouble is I had simply not been on form and could not work out why... So I did the usual solution: I bought an expensive piece of kit to solve the problem! I bought a specialized shiv, and very nice it is too, it was a bargain 2013 reduced, added Rotor QXL rings and the amazing specialized carbon cranks and some 90mm carbon wheels and we are away... well almost. 3) all my triathlon friends finally admitted they had been doing yoga for last 3 years and otherwise could not fit their TT bike... thanks guys! 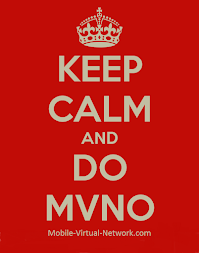 So I am doing Yoga and will be back in 2015! 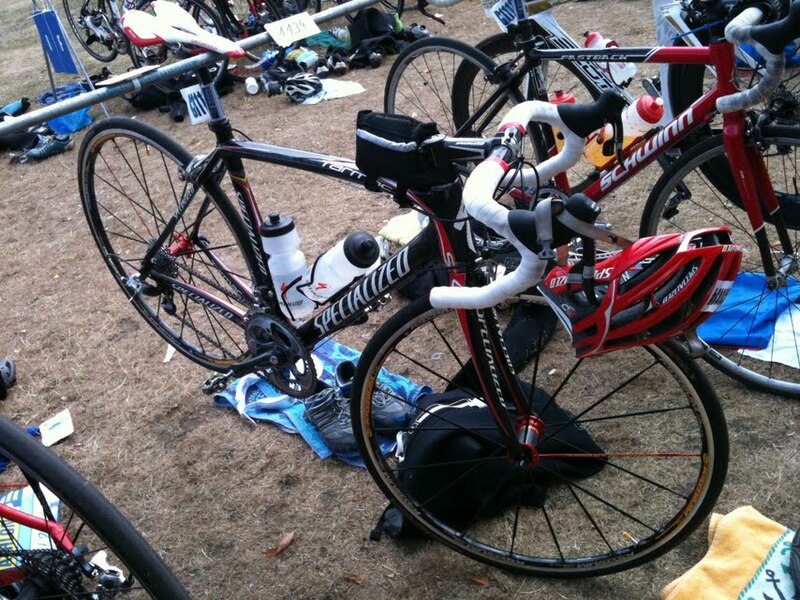 I am training for the 2013 Blenheim Triathlon. 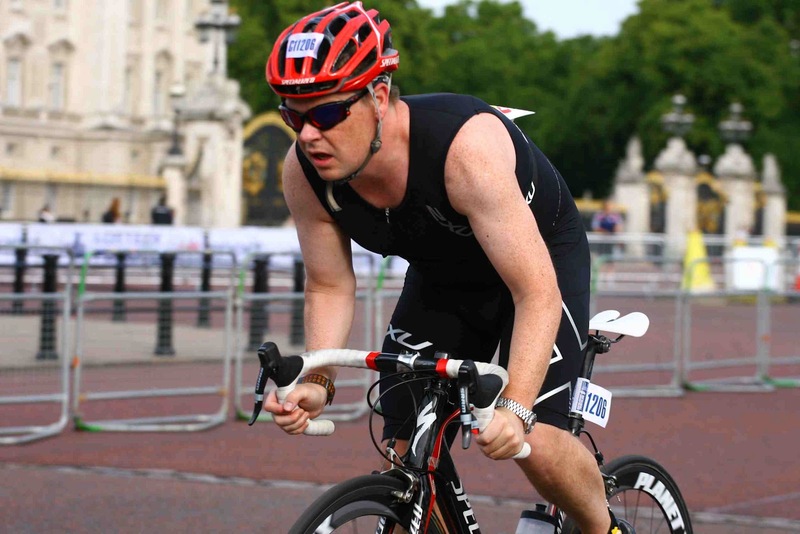 It is one of the best triathlons there is and will now be my 3rd year... training is not going too well: I was ill for two weeks in January / February, and the weather in the UK has been awful. I did the Reading half marathon in March and did a shocking 1:52, so have some way to go! 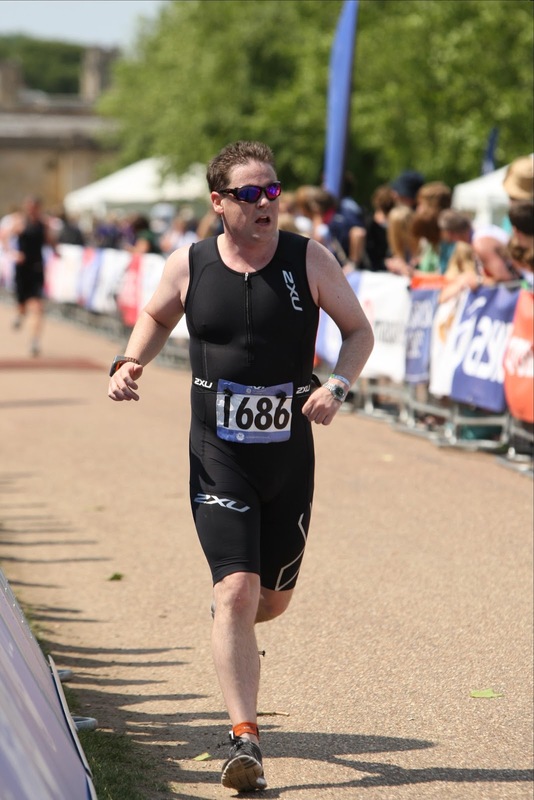 I have now done three years of triathlon; the Hyde Park Olympic twice and the Blenheim Sprint twice (different years!)... my first Olympic managed a respectable 2:35 and aiming for 2:20... assuming work, weather and injury allow... unfortunately there was no age-group race in Hyde Park in 2012 year with the London Olympics, and there is nothing else like it, so for my experiment I had to settle for just Blenheim in 2012, 9th & 10th June 2012. I did an underwhelming 1:35 last year, aiming for closer to 1;25 this year! The preparations in earnest started earlier this year. Last year I sprained my ankle in the 2010 Royal Parks Half Marathon and basically did nothing all November / December and only really kicked off in February 2011. I then took the "less is more" approach a little too seriously and over-egged the endurance training at the expense of speed, and did virtually no swimming that year until it was time for Blenheim. As a result I had a terrible swim and a bike ride where mountain bikes were overtaking me on the hills, but still had the speed on flats and downs, and made up a bit with a good run, thanks to lot's of cadence training and being able to keep a healthy but still slow 12km/h despite not being that in shape. This year, I have been good maintaining some sort of pace over the winter, though I am still not ready to do 15km/h for 5km, that would get me down to 1:25 on its own, let alone after a swim and a ride... so its now 2 weeks (3 weeks plus a wind down) to see what can be done to build on the base, try and save about 5 mins on the run and another 5 mins on the ride... the swim is not really my thing! 3 Weeks before event train mix of distance and speed; so did 10k runs, 40k bikes and then 2k sprint runs and shorter 30k bike rides with sprints in them, so apart from the booze breaks, on track. Only problem here was missing swimming entirely, thankfully Blenheim is a sprint, I would be struggling if this were an Olympic distance. They key for me is to do 1:30 hours of exercise a good few days of the week to get your body used to the strain of a triathlon. 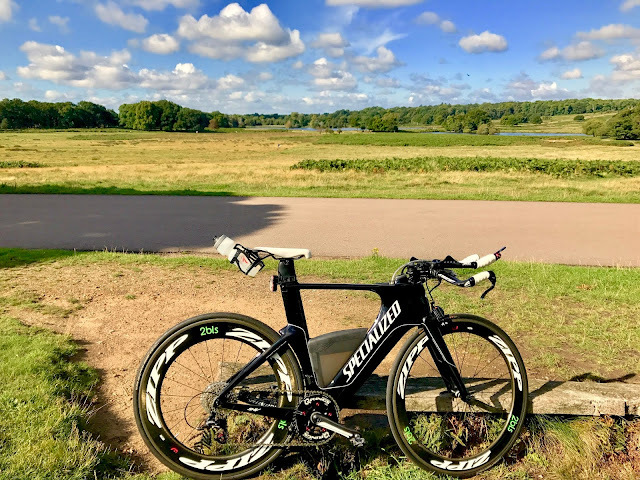 For me a bike ride is perfect: ride to Richmond park at swim heart rate (average pace), ride the park like the ride part (this requires the least simulation!) and then ride home like the clappers to simulate the strain of the run. On my way I have read many guides, magazines, books and more. I have learned a lot from great athletes like Chris McCormack and Chrissie Wellington who make time to write articles and magazines like Triathlon 220, which takes its name from the result that age groupers aspire to, however they are written by people who are also way above 220 and/or live their life for triathlon as journalists and so their training advise, while great, has little or no relevance as to how to fit this in to your work and other commitments. Of course, they write the odd article that has been inspiration to this blog, but they are a small part of the total advice and do not give any context to applying the theory or how that may evolve over time. You do also get the idea, that a lot of their views of work life are just like age groupers' advice on full-time sport: anecdotal! Stock images for search term "business person" - this is as anecdotal as the sport industry's view of age-groupers! Then there are training companions. While I am fortunate to have a group of friends to train with, they are now either falling off or going to the ironman, which again, makes their advice irrelevant... or falling off full stop, having been there, done that. I have also suspected that thee advice some people pass on is the advice they are willing to give away, not the real nuggets! so, resigned to the fact that this is a competition where I want to get to 220, no matter how many people are in front or behind of me (when you are X hundredth in your age group, does it matter a few dozen or even hundred positions up or down). Eating into work can be done cleverly, if you are flexible you can eat into your lunch break for interval training, work from home x days a week and use travel / commute time for training rather than cleaning the fridge or putting shelves up, or jig things around a bit: some people train at 6am (or earlier) which I do in the summer, but in winter i would rather be on the sofa with a blanket doing some work with industrial coffee, and then use that extra gained time for a mid morning or pre lunch run. As with the other areas below, while a bit of investment may be needed up front, the rewards will pay off in the fact that if you run twice a week at 6am, 12pm and 8pm you will be able to work coherently at these times, and produce better quality of work more often, quicker and for longer. 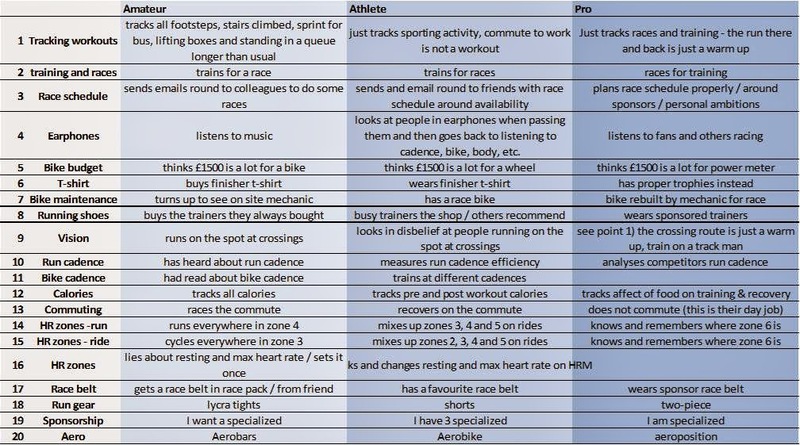 Triathlon is about picking short, medium and long term ever more achievable goals, pushing barriers and sticking with what you have planned over the medium, long and short terms, adjusting for inevitable changes and judging realistically what you can achieve in any given time frame and it pays off in droves in your work life! I plan to keep updating this and the other sections at least monthly if not weekly as the season kicks in, so hear goes. When training, your best friend is your Garmin, or other training devices, however, many people just look at them and go "nice", a bit like most product demos, stats or data presented. I consider myself lucky in that as a young professional I trained as a consultant, which teaches (the good consultants!) many counter intuitive things in life, one I remember my director saying: anybody can find, collate and present some interesting stats; average consultants just do it quicker and more refined, but good consultants try and undertand why the client is interested in them, and looks behind the data to analyse what these stats really mean for the person (or company) you are showing them to. Now, I am not pretending we all become business consultants, but given that half of the difficult part is understanding the business or the person we are presenting to, but here that "difficult half" is you, yourself and you, then the other difficult half of looking behind the simple stats should not be that difficult either. This is essentially what a good coach would do, however as an amateur, this is still a luxury, so here goes. One way to do this analysis, for people who are good at this sort of thing, is to go to DC Rainmaker and see what software he uses half way down his reviews of devices. However, I get the impression he spends rather a lot more time than I analysing his stats (and the results probably show!) but I am starting from a lower base of a balance being more emphasis on work/life than work/tri! CB log Week 11 so far, don't worry about my stat's, go and get yours! This output may be too small to read, but that is not important, what is important is the fields I am going to describe and your stats. Go to the "reports" tab a few tabs along from the usual "dashboard" that everybody looks at , select "last 7 days" from the drop down, and then click on "progress summary" and select the "Activity Distribution" by event from the drop down that appears. We are now in business. here you can click "customise" as I said above and add "Max HR". average run cadence, if too low you are not doing enough speed training or over training (your cadence drops when you are tired) pro's run at the same cadence no matter what speed they are running, they just alter their stride, while this is your goal, remember you are not a pro, you will have a higher cadence at higher speed! average speed. My slow training speed (zone 3 running) is around 11km/h, I can do sprints up to over 30km/h (we are talking seconds) longer periods at over 20 (low minutes) and speed training is whole kilometres at 15km/h, average around 12.5 to 13.5km/h depending on length and intensity and how hard my week has been. If my weekly average is 11, like this week, now Saturday 17th March I need to go and do some interval or speed training. By the way, its best to do this analysis from Thursday evening to Saturday morning, when you can still do something about it. This is where pro's and those with certain personalities / jobs will say that I should have a schedule and have done the racing according to schedule. Well, yes, you may be right, but up until a few hours ago I did not know whether I was going to be in Rome on Monday or not, or even what flight I was getting back from Rome, so with my job this is never going to work: Monday will bring what training Monday can, I will see where I am later in the week / months and do my best to adapt. Secondly, I live in London, for those of you who have trouble with context that is London United Kingdom, yes, the one with weather that changes by the hour. At this point some are saying, "you can train no matter what the weather", and you are right, however enjoyment is a key to long term success, at least for me, and I enjoy running short runs in the rain, long ones less so but passable, and swimming ditto; but cycling in the rain is a chore at best, dangerous at worst (road cycling at least) or makes more hours of work cleaning the bike (mountain bike at least) that you did training. Finally, whilst I am on a roll... I firmly subscribe to listening to your body: there are days I start out planning a long run, and either get warmed up two km in and see my cadence dropping saying I am tired, at which point a long run is risking a silly injury and unlikely to improve my fitness so go home, or I am buzzing and my body is screaming for some interval training (I may be exaggerating slightly here, but you know what I mean) and you will gain more by speed training here than trying to force speed out of a weary body and/or mind. Average heart rate: here, firstly we can see how fit we are, in theory this average should go down as we peak (if we are training right) however in a weekly graph like this it shows me a) I have spent too much time running in zone 4 and too much cycling in zone 2/3: this week is unlikely to see any great gains in fitness unless I do some speed training in both disciplines: so there, Saturday interval run, Sunday interval cycle. This should also be read in context: in order to get my three hour ride in this week I eat too much into sleep and it showed, I average 21.5 km/h on my road bike! This is no huge biggie, but it will mean I just maintained fitness rather than progressing it this week. Max heart rate, mostly just gives context to above, but also shows if I have pushed myself hard enough this week: I have not, but I still have Saturday and Sunday to compensate. Other data: later in the year elevation will be important as I try to get some climbing in, distance vs. time vs. speed is an indicator of balance but takes a lot of time to analyse, and calories is key to seeing whether you have earned yourself a pizza or a burger this week or not! This graph assumes a few things, one that you are moderately fit by now (its March and you are reading this) The big problem with running is that until you are fit, it is difficult to run in zone 3, with running you are supporting your whole body weight, so even slow jogging is quite a strain on the body. you will need to do a lot of long 3 hour bike rides at zone 3 and some work running in the dangerous zone 4 to get here, I will cover cadence elsewhere in more detail, but for now all that is needed is that you look at your run cadence when jogging: if your cadence drops quickly, go home, if your heart rate is 10bpm higher than it should be before a run, go for a gentle ride instead, it means you are tired and you will gain nothing from a run except injury, stick with it and in 2-4 weeks you can get here to start improving by analysing. A wetsuit can be hired, that is if you do not mind putting on some rubber that someone else has inevitably urinated in... call me a prim and proper Brit, but I preferred the "buy" option and got the cheap to middle range 2XU when it was on offer and I cannot resist a bargain. 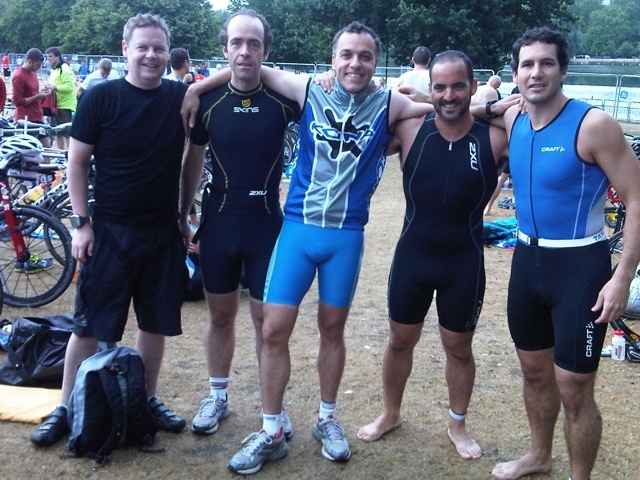 First Tri swim, especially in the Serpentine, is "an experience"
Others swam equally well in the Orca budget tri wetsuit from wiggle. To be honest, I could have gone the budget route as well. Then, past the first buoy and into a rhythm of the long 800m straight, the reeds got longer, this time they were going into your mouth as you came up for air and by now it was more of a strop than anything, again, recomposed and got on with it! Once past these eventualities, the swim was quite pleasant. There is a wonderful pitter patter of dozens of people swimming in open water together which is really rather addictive. It soon wears off as you reach the second buoy and the more Neanderthal among us start taking paths that are just not there, elbows out, their leg strokes breaking rhythm to kick defensively and a phenomenon that can only be compared to road rage overtakes many - let's call it river rage. There is that and then the realisation of the fact that the wetsuit is actually a corset and your chest is tired from fighting it for nearly half an hour. Keep the crap out of your ears, or at least let them flood and keep the same crap in your ears for the duration. I have been using these, nowhere are there instructions on how to wear them, so my results are average, but either way it is way better with than without, suggestions welcome! other things such as the head cap come with your race pack, they are coloured by wave you have been allocated (now have pink, blue and gold ones) I wear them in race as I have to but hate them otherwise. I have no idea how people train with them on, its like having a boa trying to constrict your head. er... bike(s). most people I have spoken to come to triathlon via the bike, many from mountain bikes, some from road and many of them ran to compliment their cycling. This means that bike often means first road bike, rather than first bike and so people know a thing or two, but even then road is a new world... there is a lot off debate over road vs tri bikes and many even use sportive (more upright road) bikes. The way I see it is that I spend 5-10 hours a week training on the road, and less than 5-10 hours a year racing a bike in triathlons, and moreover have one bike, so it is a road bike. I went for a specialized tarmac pro. I had done a good piece of work for a client that had been hard but paid a bonus on early delivery and other key deliverables and so had planned for an SL3 frame and build it up with SRAM red or Force. I have always like Specialized, despite also being a big fan of giant, kona and my native on-one/planet-x, but the SL3 was the way forward. Unfortunately, product managers in whatever side of the pond decided that the UK was not to get the BB30 bottom bracket version, nor could i get even the raw carbon version with standard English bottom bracket, thus relegating us to use what I then saw (and to some extend still see) as an inferior, outdated, drivetrain solution and a colour scheme I did not want. I do not understand how at this level a company as large as specialized cannot respond, but maybe somebody can fill me in. Anyway, back to the bike. I cannot recommend road tubeless enough. You can either go for fusion 3 all round, especially if you are light, or replacing the rear more often if you are heavier and use fusions front and back. Or if not, you can put Intensives on the back for better wear. If I were racing I would use atom front / fusion rear and for training use fusion front intensive rear. as you may have guessed, the weight and durability increases though from atom, then fusion, then intensive. I have since upgraded to tubs for racing, eventually plumping for Planet-X R50 and continental competition tyres and have been using them for a while training as well. Wheels can become expensive. I bought cheap aero wheels, and they are still the most expensive wheels I have bought! They do make a difference though. the Planet-X carbon tubulars are fast, properly fast, especially with the great but expensive continental competition tyres on them. Strangely; the Planet-X and Specialized logo mix works! I spent a huge amount of time researching aero bars, and eventually went for the amazingly good but expensive deda fastblack bars, however, i have used them about 5 times and never got the best out of them. Unfortunately from 11 to 15 years old I cycled and ran a lot and stretched very little and have hamstrings as tight as a clam to a stormy-sea rock and just cannot get aero. I am also a control freak on two wheels and just cannot get with the lack of control, especially when sharing a road with cars, aerobars for me are just dangerous. Then there is the performances of the Brownlees without aerobars to reinforce my view. I am stretching and we shall see, but at the moment they are not for me. The tri suit, if nothing else, is easy. I have been using 2XU suits, first the medium level one with the convenient pocket at the rear for gels, and now the compression version, still with pockets for gels. For general training, there is nothing better than gore bike wear. I am still using my phantom II jacket I first bought in 2008? and must have been thought over 1000 wash cycles by now! Glad you liked it, some more content and a revamp of this page coming soon! oh great, quick suggestion on the earplugs as suggested, I use the bog standard and cheaper silicone lumps, they mould to the shape of your outer ear cavity (not sure what that hole is called!) No leaks whatsoever ever! 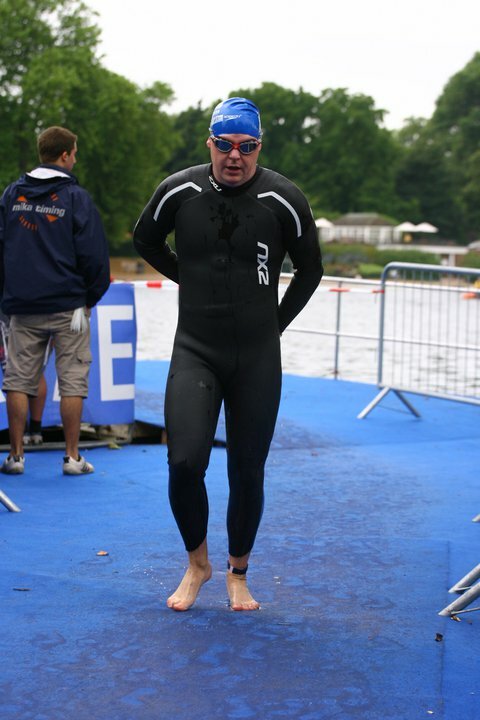 I found out that im one of those that get ultra dizzy after openwater swimming and they solved it 100% .. anyway I was looking for a guide to if it would be beneficial clipping aero bars on the Hyde Park course as im doing the AG next Saturday, I imagine there are loads of people and loads of turns so i thought maybe overkill? if we were doing the Buckingham palace route or even the age group course (tower hill) I would consider using bars, however we are doing the crappy first year u-turn route (despite paying nearly £100!) and it was a bit of a nightmare. 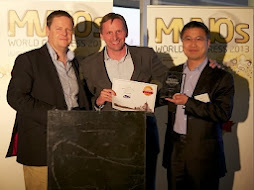 connected car, home (and bike) m2m finally becoming reality with e-cars? © Christian Borrman 2001-2018 - All Rights Reserved. Powered by Blogger.